Newborn: Measures approximately 10″ in circumference (will stretch to 13″) by 5.5″ long. Teen/Adult: Measures approximately 17″ in circumference (will stretch to 21″) by 7.5″ long. Esc – Insert hook into designated stitch. YO and pull up a loop (two loops on hook). YO and pull through one loop. YO and pull through two loops. 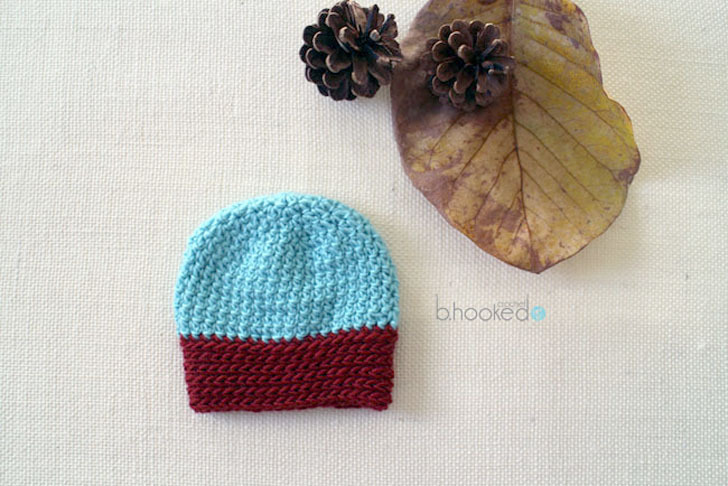 As the name implies, the inside out hat is worked backwards from the tradition method of crocheting in the round. This is because the reverse side of the extended crochet stitch has such a wonderful texture! For complete step by step instructions on which way you should be crocheting, I recommend you have a look at the provided video tutorial. If you need to adjust the sizing slightly, I recommend altering the gauge and using a 5.5 or 6 mm crochet hook. This will increase the sizing of your hat just a tad. If the magic ring is your rival, don’t worry, you aren’t alone! Try the alternate magic ring. It will save you time and frustration! Round 1: Create a magic ring with 8 Esc. Do not join. Continue to work in spiral. Rounds 6-12: Make 1 Esc in every stitch. (40 sts) At end of round 12, make slst in the last two stitches. Fasten off color A. Turn your hats so that the wrong side of the extended single crochet stitches face outward. Fasten on color B and orient your hat so the right side of the hat is facing you. Rounds 9-18: Make 1 Esc in every stitch. (64 sts) At end of round 18, make slst in the last two stitches.